Luminners® is the most significant advancement in 9,000 years of dentistry. Now you can get the smile you've always wanted that nature may not have blessed you with. Today, thousands of people who want to look and feel better about themselves are choosing to correct thier smiles with LUMMINEERS BY CERINATE. Want to know more? 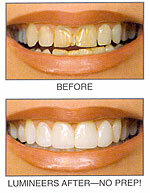 Ask us what lumineers by cerinate can do for you-maybe a life-changing smile is in your future. Easily set up an appointment for free consultation with our office.